What do you think of when people talk about lasagna? For me, it conjures up memories of "high feast days" in my family. I don't think a birthday is truly complete for my mom unless there is a lasagna at some point in the day! Lasagna holds a revered place in our home, but as with any other object of reverence, it can sometimes become a bit intimidating. Our traditional family recipe starts with making a tomato sauce that simmers with meatballs and Italian sausages for several hours. Then, this rich, velvety sauce gets layered with noodles, ricotta, grated Parmigiano, shakes of salt, and grinds of pepper until we have a lasagna big enough to feed three families. It's a lot of work, and I find it particularly irksome trying to estimate how much the noodles will expand during baking and then wrestling to fit them evenly into single layers in a pan whose dimensions don't necessarily lend themselves to the dimensions of my noodles! The end result is that I rarely make lasagna. It just strikes me as being too time-consuming! But sometimes there's nothing better than a nice, steaming-hot slice of pasta, cheese, and sauce, and I think it would border on tragedy if I let my qualms scare me off from making any lasagna ever again. Fortunately, inspiration struck, and a delicious, speedy, and homemade lasagna will now always be within my--and your--reach. So what's the trick? 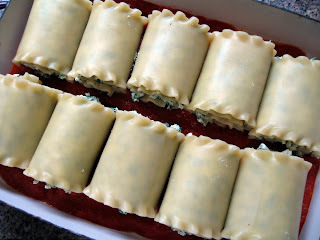 Making individual lasagna rolls! 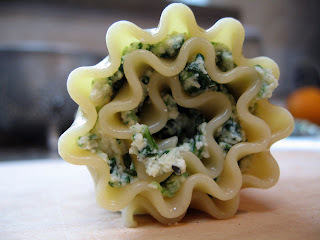 Not only do rolls eliminate the headache of trying to get the ingredients into even layers, they also are fun, individually-sized portions edged with a cute pasta frill! And while I must admit that homemade savory tomato sauce gets an incomparable boost from the slow-cooked meat, a quick and easy--yet rich and tasty--meatless sauce can also be made by using onion and carrot. I decided to try out these ideas when I had only a couple hours to make something for a friend's recent birthday potluck. 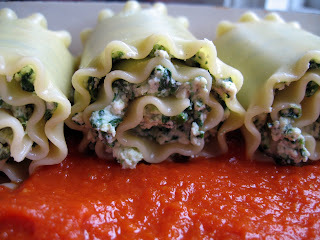 Guests could take a single lasagna roll if they wanted just a taste, or two rolls and make this their entree for the night. This was so much fun to make, and I think it worked out pretty well as a dish to share. 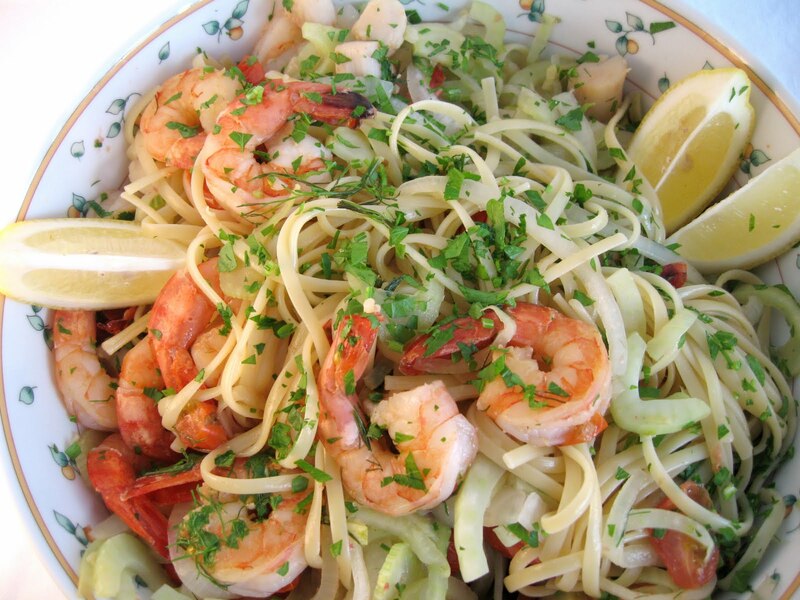 One of the things that makes this dish a beauty is the curly pasta. Keep in mind that there are (at least) two types of lasagna noodles out in the markets these days: the flat-edged, no-boil variety and the curly-edged, pre-boiling-required kind. For this recipe, you will definitely want the curly-edged kind, as the frilled edge not only helps keep the filling in place but also makes for great presentation! After mixing the filling ingredients together, you'll spread a spoonful over the entire length of each noodle and roll up into a snug little roll. Roll 'em all up and nestle them in the pan on a lush bed of tomato sauce. 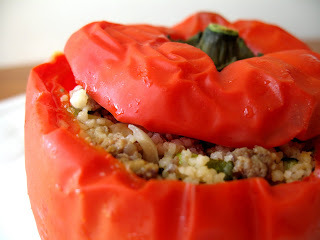 The chopped spinach adds gorgeous color to the filling. For this recipe, I prefer using frozen chopped spinach which gets thawed before being added to the tofu mixture. 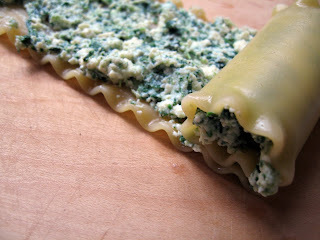 Be sure to drain the spinach well, though, so that the filling doesn't get too soft and ooze out from between the pasta layers as you roll the noodles up. Anyways, once you have your filling mixed up and rolls all assembled, just tuck the ten rolls into your pan...and there they all are! You'll cover them with more of that great tomato sauce and bake them for about an hour, then top them off with some melted mozzarella cheese. Not too bad, if you ask me! 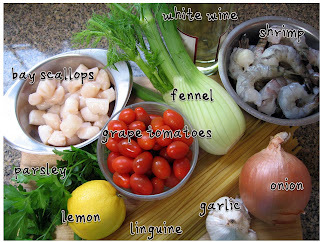 Start by making the tomato sauce: saute garlic, onion, and carrot in a medium-sized pot until onions are translucent, stirring occasionally to prevent browning. Add red pepper and basil flakes and crushed tomatoes and bring to a gentle boil, then reduce heat and simmer covered on low, until carrots are soft. Remove sauce from heat and puree with an immersion stick blender, then adjust seasoning with salt. 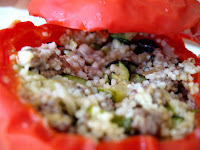 While sauce simmers, prepare the filling. Thaw the spinach by microwaving, stirring occasionally to ensure even thawing. 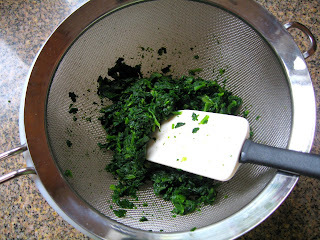 Transfer spinach to a fine-mesh sieve and press out water with a spatula or the back of a wooden spoon. In a large mixing bowl, combine all filling ingredients except for the spinach and blend until smooth with an immersion stick blender. Fold in the spinach until evenly combined. Cook the lasagna noodles in salted, boiling water according to package directions. 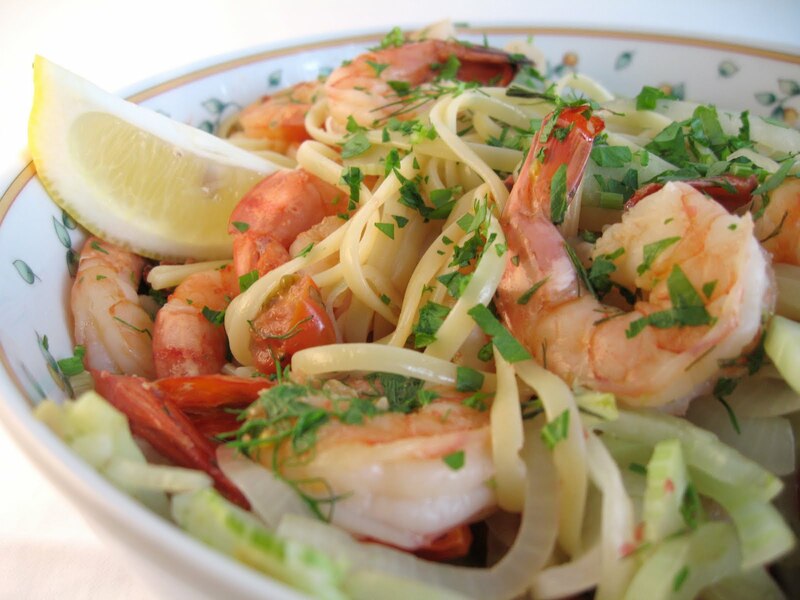 When done, remove noodles from water and separate noodles as soon as possible to prevent sticking and breakage. (I like to hang my noodles from the edge of the emptied pasta pot and from the colander I use for draining.) It's okay for the noodles to cool, but you will want to use them before they get too dry. 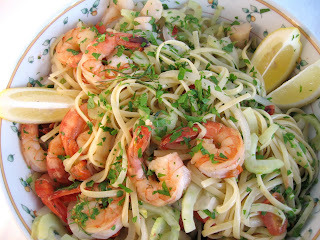 Spoon one-tenth of the filling mixture on each noodle and spread filling evenly along the entire length of the noodles. 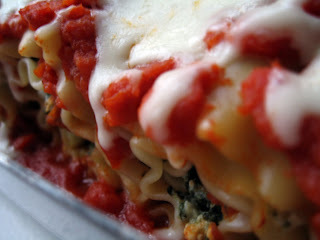 Spread 2 cups of the sauce evenly over the bottom of an 8 x 10 - inch casserole dish and arrange the lasagna rolls in it. Pour the remainder of the sauce evenly over the rolls, then cover the pan with aluminum foil. Bake for one hour at 375 F, then remove the foil and sprinkle the grated mozzarella over. Continue baking, uncovered, until mozzarella is melted and bubbly. 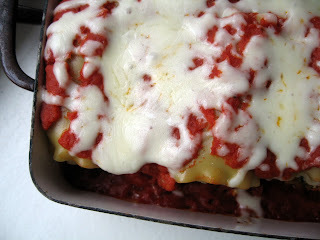 Serve lasagna rolls with extra tomato sauce from the baking dish spooned alongside. This week I've been enjoying an extra-special treat: my 18-month old nephew (okay, and my sister Anna too) are visiting all the way out from Pittsburgh. 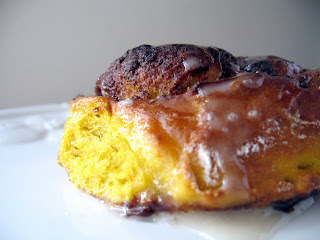 So, I wanted to make an extra-special breakfast, and knowing that Anna loves my pumpkin pancakes, I thought she'd love something like these pumpkin cinnamon rolls. The egg-y yeast bread, fragrant with pumpkin, is a perfect backdrop for the brown sugar and cinnamon filling that bubbles up and over the rolls while they bake. And drizzled with a vanilla-buttermilk icing, these breakfast spirals don't get much better. Except for maybe the fact that the dough is really easy to mix up and there's no kneading necessary! 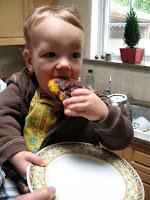 A little boy found his way into the kitchen as I was just finishing up icing the pan of rolls. Good morning Teo! 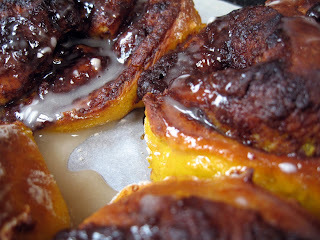 Ready to try some pumpkin cinnamon rolls? 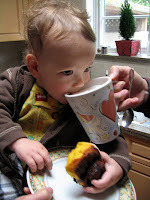 Well what do you know...he gets a cinnamon roll AND freshly steamed milk foam for breakfast. Lucky boy. Combine warm water and sugar in a large bowl of a stand mixer, and sprinkle yeast over. Let sit until foamy, about 10 minutes. (If yeast doesn't foam, discard and start over with new yeast. Add pumpkin, eggs, butter, and salt, and beat with paddle attachment until thoroughly mixed. Add flour one cupful at a time, mixing well between additions. (The dough will be rather sticky.) Scrape down the sides of the bowl to form a ball of dough. 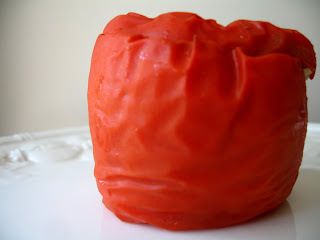 Cover with plastic wrap and a towel and let rise in a warm place until doubled, about 1 hour. Meanwhile, mix together filling ingredients. Turn dough out onto a well-floured piece of parchment or wax paper and sprinkle evenly with flour. Roll dough out to a 24 x 16-inch rectangle, then sprinkle filling evenly over the dough. Roll up the dough jelly-roll style to enclose the filling, lifting the parchment paper and scraping the dough off of it to aid rolling. (The dough becomes stickier the longer it rests, so it is important to work quickly.) 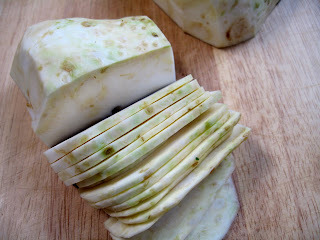 Cut roll into twelve 1 1/2-inch slices and arrange 1 inch apart on a baking sheet lined with parchment paper. Let rolls rise 20 minutes, then bake in a 425 F oven until golden, about 20 minutes. Whisk together the icing ingredients and drizzle over the rolls. For the best experience, serve these luscious rolls while they are still warm from the oven. This week I've been reveling in fresh vegetables. And when I saw a recent winter salad recipe by Molly Wizenberg, I was thrilled to try it out. 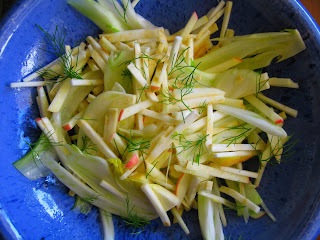 It's a crispy slaw of raw julienned celery root, fennel bulb, and apples, dressed with a light vinaigrette. The vinaigrette is absolutely fabulous; made with Dijon mustard (one of my favorite pantry items! 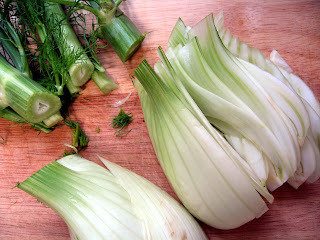 ), the juice from a clove of finely grated garlic, and a squeeze of lemon, it is deliciously tangy. I used (un-roasted) sesame oil, since I didn't have the hazelnut oil on hand that Molly suggested, but the sesame oil nonetheless contributed a subtle nutty flavor. 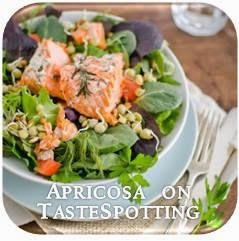 I recommend mixing up the vinaigrette in a glass jar: first, it's super easy to emulsify the oils by a few shakes of the (tightly capped) jar, and second, the recipe makes quite a bit of vinaigrette, and having it already in the jar will make it easy to store any leftovers for your next salad. 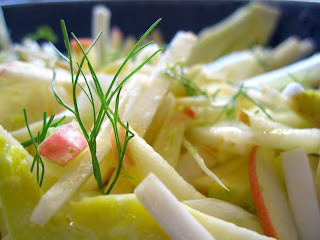 As for the salad itself, the sweet slivers of apple contrast nicely with the mellow celery root and fresh fennel. I know raw isn't for everyone, but if you are the mood for something super healthy and cleansing, this is the salad for you! then stack the slices and cut them crosswise into matchsticks. 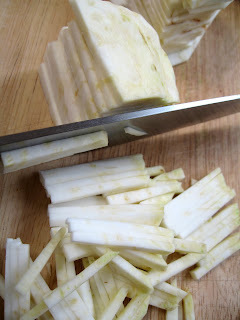 then place the cut side down and thinly slice. 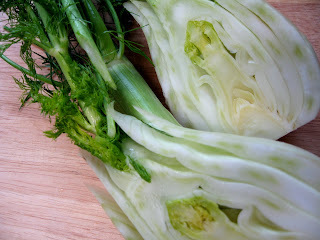 You can julienne the fennel too, but you might want to leave some of the slices intact for fun visual contrast. By the way, the recipe calls for a "medium" celery root; if you're wondering how big that is, I'd say think no bigger than a softball. Mine was slightly larger and I ended up having a huge salad! I really loved the apple flavors, so I added a second one into the mix. Crunchy and fresh, I think you'll enjoy munching on this!